When you’re using video conferencing to communicate with clients and colleagues, you should approach meetings the same way you would if they were in person. Body language makes a huge difference since you maintain a visual component while on video. This can be both a curse and a blessing, though, depending on how effective you are at projecting confidence and openness. Here are a few tips about how to use your body language to best advantage during video conferences. In order to fully utilize good body language tactics, first you need to have a reliable video conferencing system in place. These days, this technology is more accessible than ever and offered to both small businesses as well as major corporations. The Blue Jeans Network is a well-known provider of video conferencing services and is a good place to start if you want to take the communications plan for your business up a notch. Once you’ve got the video conferencing component in place, it’s time to really consider body language and how to use it to augment your business communication. Businessballs defines body language as not only the position of your body itself, but also how your eyes move, contact with inanimate objects such as a desk or pen, and facial expressions. Body language does not include the volume or tone of your voice, however, since the entire idea of reading physicality is based on wordless cues. Everyone knows that keeping eye contact is a good way to reassure other people that you’re paying attention to what they’re saying, but it also goes deeper than that. Career Cast advises that in order to convey confidence, match the motion of your eyes with what you’re saying and maintain eye contact with the person to whom you’re speaking. This gives you a self-assured air that will compel other people to listen to you and trust your words. Eye contact is one of the most important parts of using body language effectively in a business context. The American Management Association names one of the most powerful factors in encouraging collaboration and participation in a meeting as the removal of barriers. Just like a face-to-face meeting, during a video conference, there are various items that can obstruct your body or line of vision. The AMA gives the example of holding a coffee cup too high and creating an unintentional barrier. Make sure that you set up your space before the video conference begins and remove any extra items from your desktop. If you can forego eating or drinking during the video conference, then do so. Even a bottle of water can interrupt the flow of conversation by creating a physical barrier, so try to keep your attention riveted on whoever is talking. According to Forbes, the area of the brain responsible for speech production also has an effect on what’s happening with your hands, and gesticulating as you speak can actually help to effectively communicate information, energize thought, and convey confidence. Articulating yourself with a combination of words and hand gestures drives the points you’re making home, while simultaneously providing a bit of a brain boost to you personally. Forbes also suggests steepling fingers and using open hand gestures since it invites discussion. According to Helpguide, the way you fill space with your body language matters a great deal in whether you’re projecting openness or aggression. Obviously, in a professional setting, while aggression of the positive variety has its place, getting too close to someone whether in person or on camera can have a negative, suffocating impact. Therefore, keeping enough open space between you and the camera itself is a good tactic to maintain openness. You want participants in the conversation to feel like there’s room for their voices as well as yours, and you don’t want to come off as overly aggressive. You want to occupy the space around you enough that your presence is felt, but you also don’t want to be overbearing. A good way to make sure you’re filling up space in an appropriate manner is to lean forward when someone else is talking in order to show that you’re actively listening, but then maintaining a comfortable distance from your camera when it’s your turn to speak. Just like talking in person, the closer you are to the camera, the more of an in-your-face feeling you give off. Body language is one of the most powerful communication techniques in business. It can make or break a business deal, since clients and coworkers are potentially placing their trust in your opinion. If you’re able to project confidence, it will also equates to quality and results. 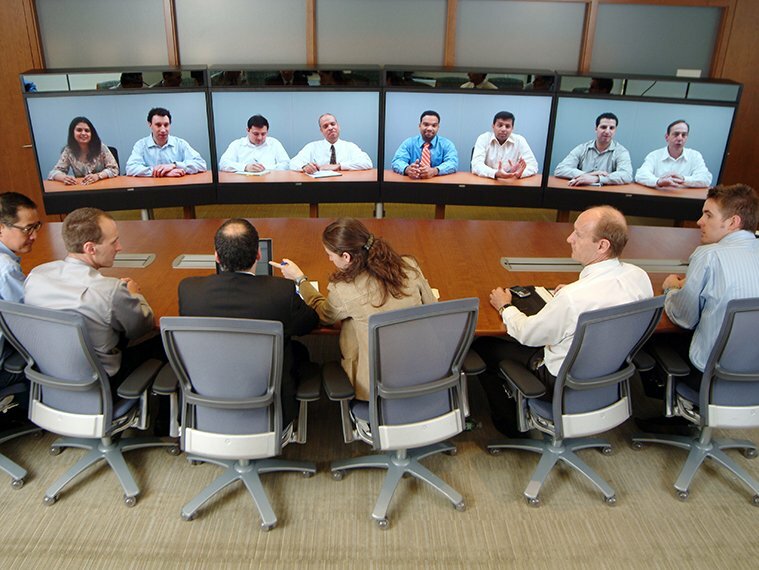 When you’re video conferencing, you always want to keep the environment serious, productive, and focused. Ensuring you keep your body language open and accessible while also using it as a way to wordlessly enhance your contributions to the conservation will take you far.